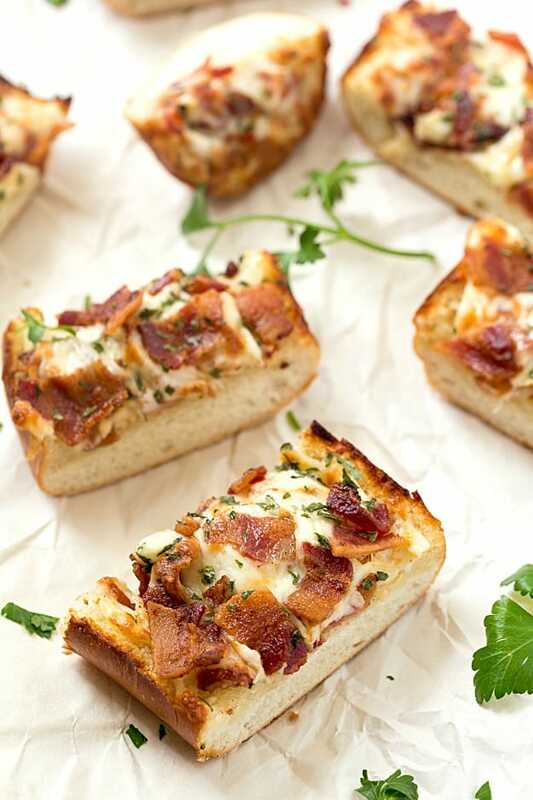 Cheesy Bacon Ranch Garlic Bread – Not just another cheesy garlic bread recipe! This bread is fantastic, and we were able to stop eating it! With a few changes, you can have homemade, and this easy garlic bread is taken to a whole new level! The best garlic spread with the addition of ranch seasoning! There is nothing better in this world than cheesy, buttered-garlicky bread. I love seeing the gooey, stringy melted cheese pull away as you take a piece when it’s sizzling hot. 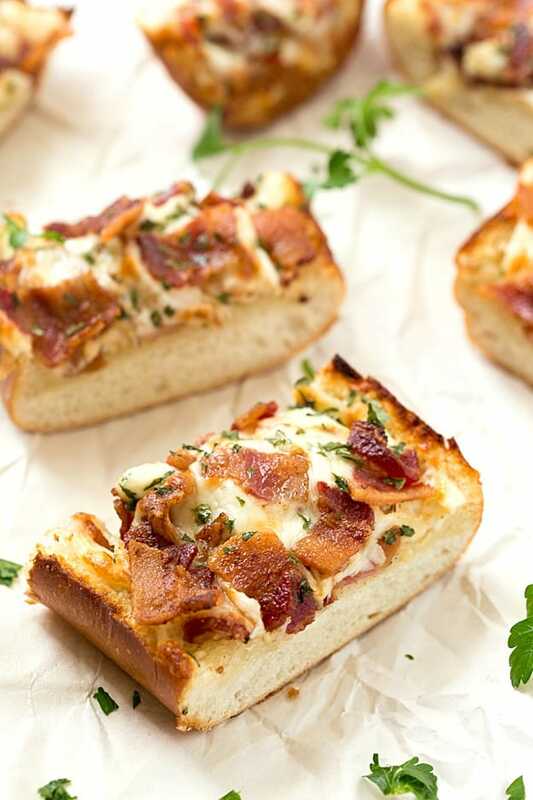 I may have exaggerated a little because there are things that may be better, but all I can think about is this cheesy bacon ranch garlic bread. It’s on my mind, and I wish I could indulge in a few pieces right now. Instead, I will just tell you why you need to make this cheesy garlic bread ASAP. I am going to say that this isn’t your traditional garlic bread. 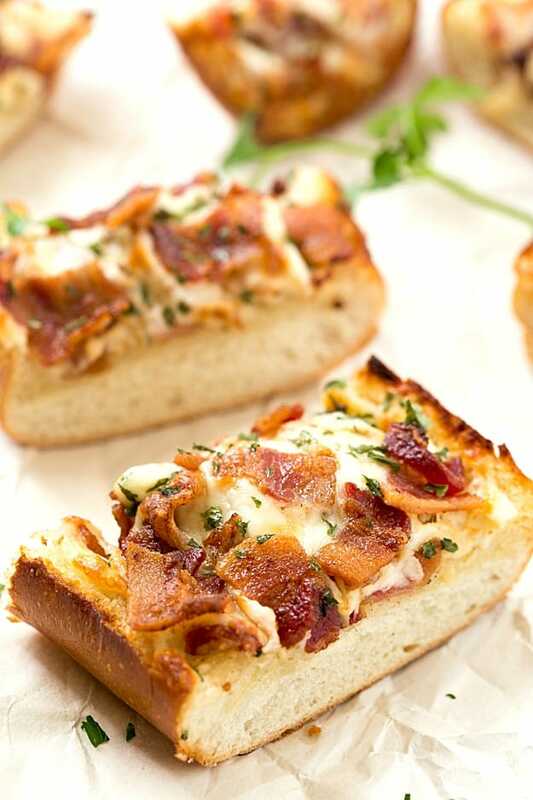 The bacon and ranch take boring old cheesy garlic bread to a whole new level. It’s another level I thought I would never visit with garlic bread because garlic bread is great already. Seriously, go check to see if you have these items in your pantry and refrigerator, or even make a quick run to the store. It’s a must-make! If you love cheesy bread, I highly recommend trying our buffalo chicken french bread! 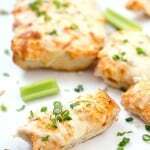 It’s the perfect appetizer for games or for a party. Each slice contains the perfect balance of butter, garlic, ranch seasoning, bacon, and cheese. There is one thing I will say this bread isn’t – greasy. It contains the right amount of butter mixed with a little olive oil, mixed with minced garlic, and slathered on French bread. If you have been following my recipes for a few weeks, you may have noticed I have been on the keto diet. I haven’t felt the need to “cheat” with other foods until this cheesy bacon ranch garlic bread came out of the oven. I couldn’t help myself. Was it worth it? Absolutely! The best decision ever. Life’s too short. I highly recommend this ranch seasoning because it contains the best flavor, we think so. I also highly recommend using a medium-sized baking sheet. Preheat oven to 400 degrees. Place two pieces of aluminum foil and place side by side allowing one side to overlap slightly the other on a rimmed baking sheet. Slice bread in half lengthwise through the height of the bread. Place bread cut side up on the baking sheet. Mix the butter, olive oil, minced garlic, pepper, salt, and ranch seasoning mix in a small bowl. Spoon and spread the mixture evenly on the entire surface of both bread halves if using a medium french bread, or on one-half if using a larger French bread. Wrap foil over the bread and bake for 10 minutes. Remove from oven, open the foil and roll inward toward the bread. Add 4 pieces (half) of the bacon pieces to the top of the bread. Sprinkle with the mozzarella and parmesan cheeses. Bake for an additional 6 minutes longer. Broil for the last 1-2 minutes for a crispier bread and a more golden cheese, if desired. Top with fresh parsley. Cut into slices and serve warm. Recipe slightly adapted fromCooking Classy's Cheesy Garlic Bread.